There are so many cat trees out there and it’s pretty difficult to know which one to choose. 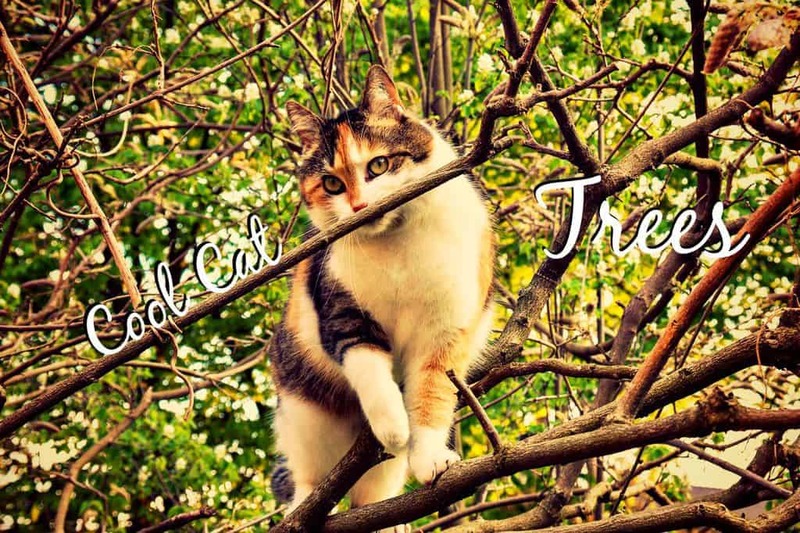 We decided to select the best cat trees in order to make your life easier. 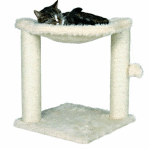 Our unique selection of cool cat tree furniture is based on an in depth review and tests of customers. But first off, let me tell you how to select the best cat tree for your cat. First, there are several questions you should try to answer. How many cats will be climbing? Depending on how many cats you have, you might want to invest in a bigger tree. You want each cat to be able to have a platform for him/herself. Equality is a right for cats too 🙂 Those tiny beasts can become jealous, avoid a war by giving them the space they deserve! Is your cat a light weight (<10 pounds ) or is he more the Garfield type? Depending on the size and weight it’s important to evaluate the sturdiness of the tree you are going to buy. You dont want the cat tree to crumble as your cat(s) jump on and off of it. That would be a CAT-astrophe 🙂 (If your cat is a bigger beast, check out our dedicated article on the best cat trees for large cats). How much room do you actually have? Well this might be important too! A cat tree is pretty cumbersome. It’s just important to make sure you will have enough room before you buy the tree. I would be particularly attentive to the height: while some cat trees are no higher than your knee, some can reach your ceiling. Make sure you check that out before you end up with the Eiffel Tower in your living room. In any case, your cat would tell you: the higher the better! As I’m writing this, Yoda is actually climbing on the highest tree of the kitchen (our fridge ^^). 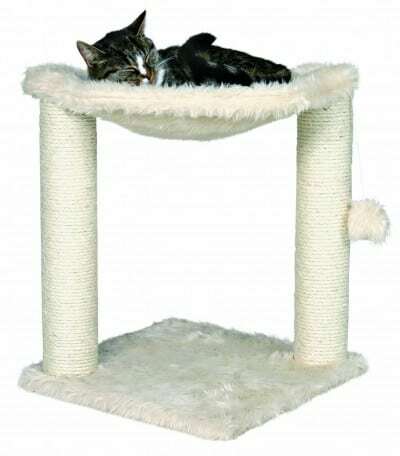 All the cat tree furniture presented on this page meet high standard requirements so you can find the best product adapted to your little one. As you know, cats love to reach higher grounds. 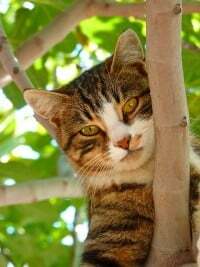 A tall cat tree will provide just that but you do need to make sure the piece of furniture is quality made and sturdy enough to support your cat’s craziness. 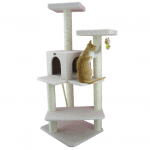 That is why the tallest cat tree highly recommended by Fluffy Kitty is the Armakat Deluxe Cat Tree. First of all, this is a very reliable brand. They have been on the market for about 18 years now meaning they know their job pretty well! All their products are designed by professional pet product designers: they are using only environmental friendly material so it’s completely safe and harmless for your furry friend. It is solid as a rock. This cat tree is designed to sustain up to 80 pounds!!! Pretty amazing isn’t it? Except if you have several mammouth size cats, this tree should do the trick! The entire structure remains solid even if your cat(s) are jumping around. They put a good attention to the way the posts are anchored and the position of the higher perches makes it stable in every situation. 1 hammock, 5 platforms including a little house, 9 scratching posts… This cat tree is simply a dream come true for your cat. Let’s not forget to mention that all those parts are very easy to assemble. For all that this cat tree provides, the price is honestly a bargain. 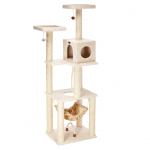 Check out all other cat trees and it’s very hard to compete with such a high quality tree at such a low price. It’s the perfect cat tree for a multiple cat household. Get the Armakat Deluxe on Amazon! Medium means it’s saving some space compared to the tall one, it’s a bit cheaper but it still provides all the accessories your cat needs to fully exercise and stretch. In this category you could choose between the Go pet club cat tree or, like us, the Armakat B5701 that we believe provides the best value! Strong materials here! The pressed wood is ideal for a sturdy structure and it will guarantee a very long life to this amazing tree. This is a fantastic product that will provide everything your cat needs to be happy! The design is specifically created for your cat to play and stay entertained throughout the day. 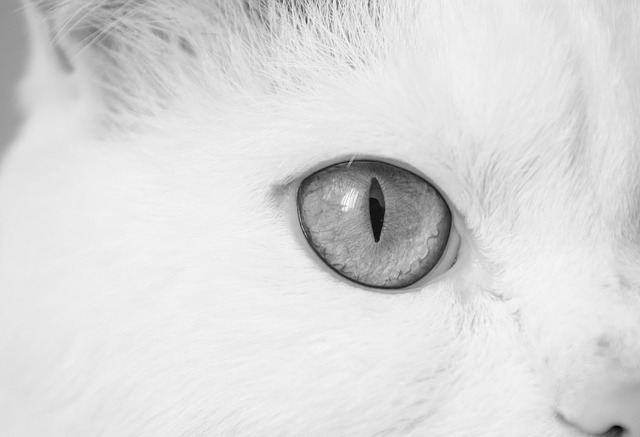 It’s amazing for your cat and it’s also very affordable for you. The same item in any of your local pet stores will probably be 3 times the price than what you will find on Amazon. Check out the stellar reviews and tell us what you think! 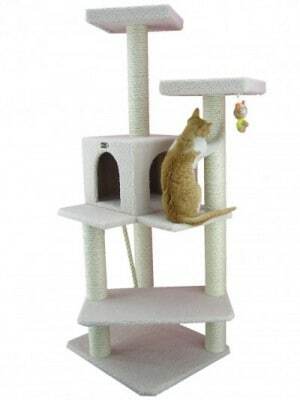 You want a cat tree but do not have so much space or money? You might be looking for a smaller item that is not too big and not too expensive but can still provide a fun and comfortable environment for your cat. A product designed as a nest for your furry friend. It’s a small cat tree but can still fit an adult cat. If you need something simple, this is definitely a great pick! It takes barely 5 minutes to set it up and your cat will love it for sure! This little tree can hold up to 16 pounds and more! Adult cats fit in it with no problem at all. Check all the reviews on Amazon and you will see for yourself. It does not move a bit when your feline friend jumps in it. Super stable cat tree! The hammock is a total hit, it’s super fluffy and soft! It’s tiny yes, but it gets straight to the point! Two scratching posts, a little fluffy hanging toy and a super comfy plush hammock. This Pixie product is without any doubt a great alternative for your cat! If you are on a budget or are looking for simplicity, this bed is our recommendation for a happy cat! 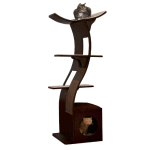 Are you looking for a refined and modern cat tree? This one might be just what you need! A great attention has been paid to design so you can integrate it easily in your home. It has everything a great cat tree should have and more! For a superb looking piece of furniture like this one, you will have to pay the price! But it’s really one of a kind so we don’t think you will regret your purchase. Well well, if you made it this far, thank you! We appreciate your trust for reviewing your favorite products! Cat trees are everywhere nowadays and we know how tough it is to choose something good in this beautiful mess. Before starting this blog and when Yoda joined our family we had to find the perfect cat tree and it was not easy. 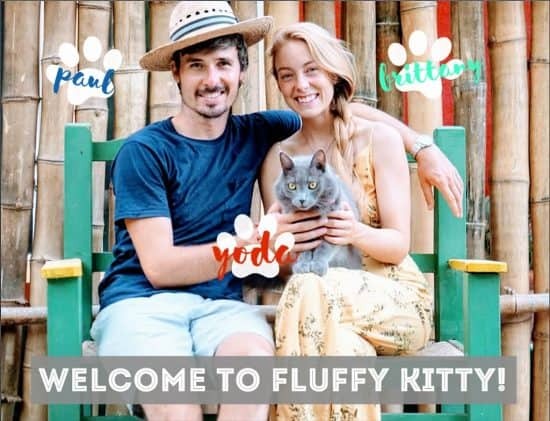 After studying the market, we figured out what was best for our cat and wanted to share our experience with you guys! We hope we helped you out narrowing down your options! If you have any remarks or suggestions, please leave us a comment or send us an email through our contact form! Next Post How to calm my cat down ?